Trishuli River is located to the west of Kathmandu Valley attached to Prithvi Highway. One can add Trisuli River Rafting while going to Pokhara or Chitwan. This adventurous activity begins from the place called Fishling which is 3/4 hours driving distance from Kathmandu. Trishuli River rafting rapid has been measured as plus three grade and can be participated by the beginners as well. Our highly trained rafting guide and kayakers will be escorting the whole rafting so that everybody get safe and enjoy this adventurous activity. Almost 20 km river distance will be covered in this rafting. After completing half distance rafting, there will be a lunch break on the beach of Trishuli River. Finishing the delicious meal, the rafting will be continued up to the place called Malekhu. From here, either drive back to Kathmandu or continue drive to Pokhara or Chitwan. Trishuli River Rafting can be extended for another two more days staying overnight in a tented camp at the beach of Trishuli River enjoying the BBQ and dances. Day 01: Rafting at Trishuli River. 6:30 AM: Pick up from your hotel and drive to Fishling. It takes approximately 3 hours to reach there. Assemble all members and our guide will be providing the pre-rafting training. 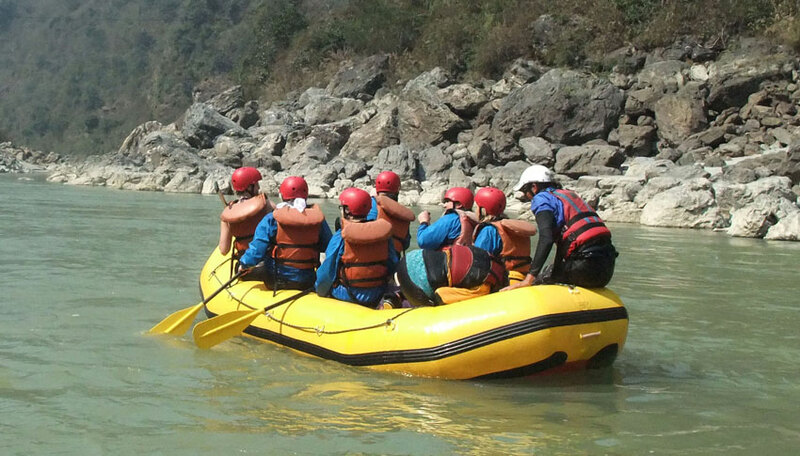 Grear up and begins the adventurous rafting at Trishuli River. On the beach, take a break for lunch. Then, continue rafting up to the Malekhu. Completing the rafting drive back to Kathmandu. Then, drop to your hotel. Our Trip finished here! Kathmandu to Fishling drive by a private car. Malekhu to Kathmandu back by a private car. All the necessary rafting gears. And rest of all that are not mentioned in cost include. Wants some modification on Trishuli River Rafting itinerary? contact us to customize it.